Call Columbus Garage Door Pros Today! Two things are to be suspected here. A broken tension spring is the first one. The springs should hold the weight of the door to allow it move smoothly. If the springs are intact, the cable attaching the springs to the door may be broken. A garage door specialist should handle either of problems since it is very dangerous working with such a door. A garage door track that is out of alignment can cause a serious garage door problem. For your door to move, its metal track needs to be properly aligned. The rollers and the rail do not need to have gaps in between them. You will know your garage door has a problem when you can see gaps in between the rollers and rail. At first, the door will not give you much trouble. However, with time, the door weight can make the misalignment extreme and the door becomes dangerous to operate. It is very unsettling to realize that your garage door can randomly open or close even when you are not around. When you realize such a problem, the first suspect should be the transmitter. If the transmitter is stuck under something, it can cause self-operation due to depression of the control mechanism. It is also advisable to check the frequency range of your transmitter. Chances are that someone else in the neighborhood has a transmitter with similar frequency to yours. Therefore, when they open or close their garage door, the same thing happens to yours. Photo eyes are located on either side of your garage door. There is an invisible beam that runs between the two photo eyes. 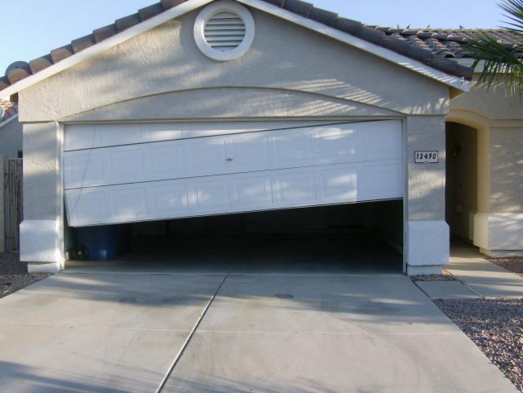 If it gets broken, your garage door will fail to close. 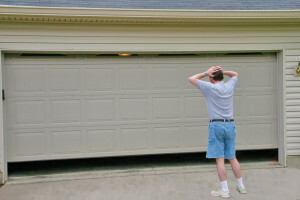 If your garage door fails to close, check if the two eyes are dirty or misaligned. There is always a manual on how to inspect and clean a garage door’s photo eye. Use it. Most garage doors have a reverse mechanism within their design, which helps prevent crushing any object within their path during operation. The half-closing then re-opening can be because of an object such as a can on the ground. The door will use the reverse mechanism to open again to avoid crushing the can. Likewise, accumulation of debris on the tracks can hinder the rollers from rolling forward hence the reverse mechanism will be effected. Other objects that can trigger reverse mechanism unnoticeably are mud and chewing gum. You may not be guaranteed of the cause of such an action. However, if it happens, the first thing to suspect should be the close and open limit settings on your garage door opener. The range setting shows the door where to reach for it to be fully shut. If you set the range too high, your door will reach the ground before the opener decodes it. It will then assume that the door has hit an obstacle on its way down. The automatic reverse mechanism will be triggered, making the door go back to prevent crushing the obstacle. This can be solved by checking on the manufacturer’s manual on how to set your doors close and open limits. Before we discuss anything about this, it is good you know that the heavy garage door is opened by the springs rather than the opener. All the weight to be lifted is dependent on the springs. A garage door has either one or two springs. This means that if the spring breaks, the garage door will struggle a lot to open the door and may even fail completely. Such a door is very dangerous to operate. It requires the immediate attention of a garage door specialist. Garage door manufacturers design the doors in such a way that they can be operated manually if power fails. The door has a disconnect switch for the automatic door opener. The switch is attached to a knob or rope that can accidentally unhook. All you need to do is close or open the door completely then hook on the rope securely. Trying to open or close the door using the transmitter should work fine after this. This is a common problem especially when the door is closed. Usually, what happens is that the motor cannot lift the door. The first suspect should be the springs. If they are okay, check for obstacles on the track. If the track is clear, there are chances your door has an inbuilt lock that may have accidentally engaged. Older doors are more likely to suffer this problem. It does not sound serious, does it? Most at times people do not remember that the transmitter mechanism uses batteries to operate. At times, it may be the transmitter found in your garage walls. An easy way to detect this is by benchmarking with other garage doors that were installed at the same time. If they have been or are experiencing the same problem, then it is time to replace your transmitter batteries. Grinding, squeaking or screeching of the garage door is caused by either debris or dirt on the tracks or lack of lubrication. Non-corrosive cleaning agent can be used to clean the track and then special garage oil used to lubricate the track.